This week the wonderful world of digital just keeps on moving along. From a boom in branded VR headwear to Slack getting into the video & voice chat business, plus Snapchat is the new cable, you can pay for things hands free soon enough, and behind the scenes of the circus that is the race for the White House, is some serious tech stacks. All this and a few other bonus digital treats as we get our Friday fix of digital marketing news. Given the snowfall at our Toronto office this week’s edition is inspired by the last barman poet, and the dreaming of tropical weather cocktail, the Singapore Sling. This week, brands really discovered the power of making their own VR Goggles. 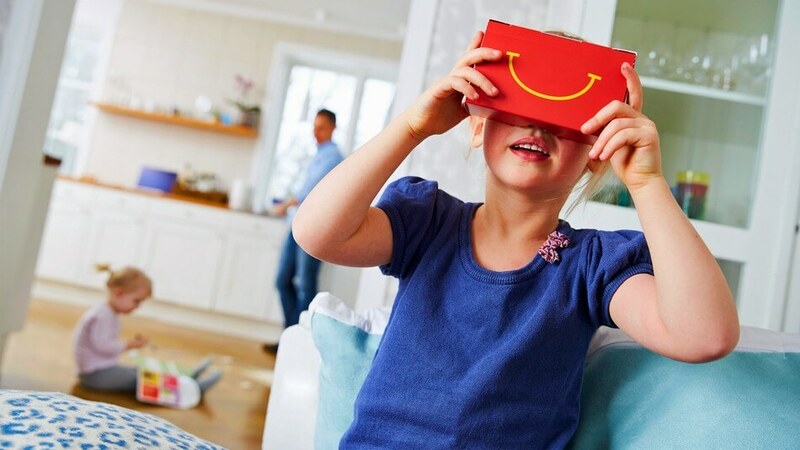 In Sweden, McDonald’s has started turning their Happy Meals boxes into VR headsets called Happy Goggles that were designed for a ski-themed VR Game called Slope Stars. That’s VR goggles similar to Google’s at just $4.10. Not to be outdone, Coca Cola got into the act using their packaging and claiming the first recycled VR goggles. The question will be, how many brands will now jump on this bandwagon – it’s like the branded flash drive or laser pointer booms of the past. Google is rolling out something they are calling Hands Free, and residents of San Francisco’s South Bay community can now try to pay at local McDonald’s and Papa Johns restaurants that used the app, Bluetooth, location-based services and wifi to pay with your initials and verifying by photo after saying “I’ll pay with Google”. It’s fascinating to see how far we’ve come from debit, to tap, to now just saying your initials. Is this the future of commerce at retail? 3. Coming to a Slack soon, Video & voice chat? 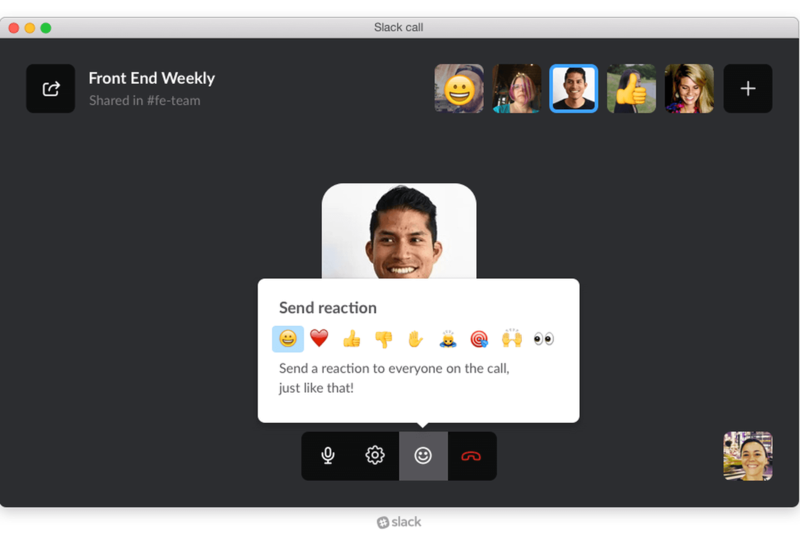 As devotees to Slack, we were pretty stocked to hear that they are already rolling out Slack Calls – a new feature that I’m sure the 2.3 million daily users will be excited about. So it should be available for about 50% of users already, and they’ve added the right amount of “slackiness” to this with visual emoji reactions that accompany your video. So will we be saying goodbye to gChat and /appear and just slack calling all spring? Or will people get Slack fatigue and break up with it? Time will tell. 4. 2016 Political Nerd stacks. Take another sip of your Singapore Sling, and let’s dive into the wonderful world of political tech. For the race to the White House, Contently shares what the candidates are using. 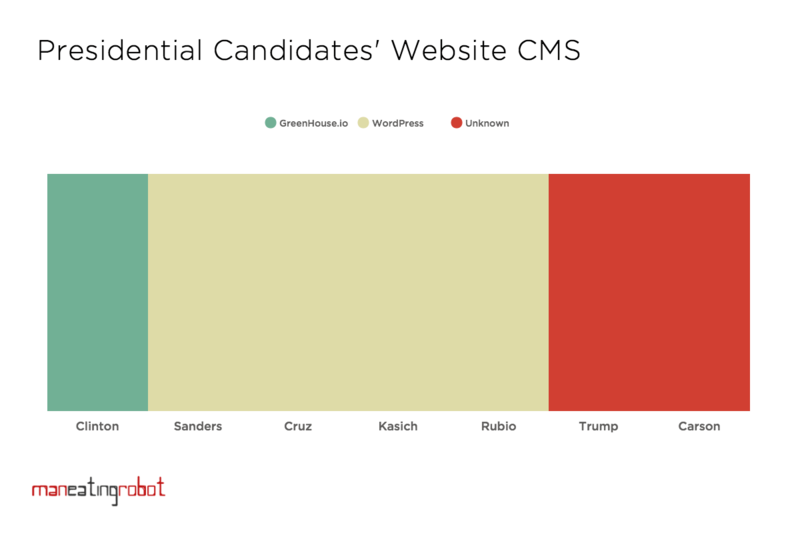 If you’re a WordPress fan, your candidates are Bernie Sanders, Ted Cruz, John Kasich, and Marco Rubio. Hilary Clinton is riding solo using Greenhouse.io, while Ben Carson, and everyone’s favorite Donald Trump’s CMS’ are unknown. Although as Contently notes, Trump’s site may be run by the same engine powering “his hair”. Surprisingly, it looks like Mailchimp is the only one feeling the Bern of Sanders, while Trump is the lone candidate not making Google Apps great again. Another big story unfolding is the power of Snapchat it’s not only the fact that they have built a business by confusing olds. Not only did they rollout some pretty extensive geo-filters for places and businesses this week, and the ability to view video on their website, now everyone can’t stop really talking about it as a platform non-unlike the power of cable TV. And that is really evidenced by their recent deals with ad Tech companies and Nielson to provide, for digital ad ratings. So now that they have 100 million daily active users, they want to turn the money faucet on full blast. Sweet, we made it. Another big week in digital is in the books! In addition to the all there was some amazing shoe tech in these Converse Beacons, another social fail this time by the Montreal Canadiens (Mon Dieu! ), and the end must be near, Apple just joined social media. Next week, we’ll have a special nerd marketing preview of SXSW and the panels we’re drooling over.